I have a 14 month old GSD. He is a great pet and companion. I'm curious about his behavior with other dogs though. He's pretty aloof, keeps to himself, loves to chase the ball. I've observed that he really seems to be submissive to other dogs the minute they get aroused or agitated. My guy just drops to the ground....or runs to me. He must still see me as his protector. I'm wondering if he'll remain this submissive once he's fully matured? Thanks for asking. This is fairly typical in a lot of dogs I have been around, not just German Shepherds. 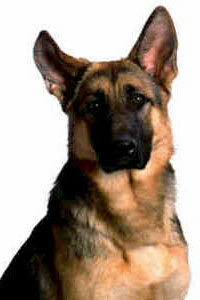 Especially in younger dogs and ones that do not have a lot of contact day to day with other dogs. It's really hard to say whether he'll stay "submissive" or not though because there are just so many factors involved. Everything from heredity to the pups background, the experiences he has had (good and bad) and seriously, even your German Shepherds own inherent temperament. Not all animals will be the more dominant figures in social interplay. It's just not possible - for healthy interaction some have to be submissive to the dominants - otherwise there will be loads of disputes, injuries and possibly even deaths. So, to keep the peace some are submissives, some are dominants in the animal world. But thats not to say that your boy won't become more assured of himself and maybe even more of a dominant character as time goes on. Your dog is still a baby even though he's probably over 80 pounds at this point. But his mind and body still have about 18 months or so until he is fully mature, so give him some time. There are a lot of dog training exercises that you can do to help build his self esteem in the meantime. Talk to a local trainer in your area and I'm sure they can give you some exercises to try in the near future. Good luck with your boy! I have raised German Shepherd Dogs for over 35 years and found out in my experience, they are not a social dog like a lot of other dogs. Of course there are the expectations, but for the most part they are not the ones to come bouncing out of a car and joining other dogs at the park. They seem to stick to their jobs of taking care of their people and property. If your kid prefers to stay at home, I see nothing wrong with that. Just so he gets his exercise in the yard or just a walk. If you walk with him early in the a.m. you will run into less dogs to be confronted with. You may do well with a cat for him to play with (be sure the cat is one who accepts dogs) My dogs are not dog friendly. They do not intend to hurt, just let the other dog know that they are the dominant one. If you are in a situation where another dog is trying to show dominance, and he runs to you, show your protection and slowly bring him to another dog and pet them both, letting him know there is nothing to fear. This will not work overnight, but takes time and consideration for his problem, but can be overcome. As he gets older, he may become the dominant one due to being pushed around by others. If you watch a litter of puppies, you can see the dominant and the passive ones as they play, or go to nurse.